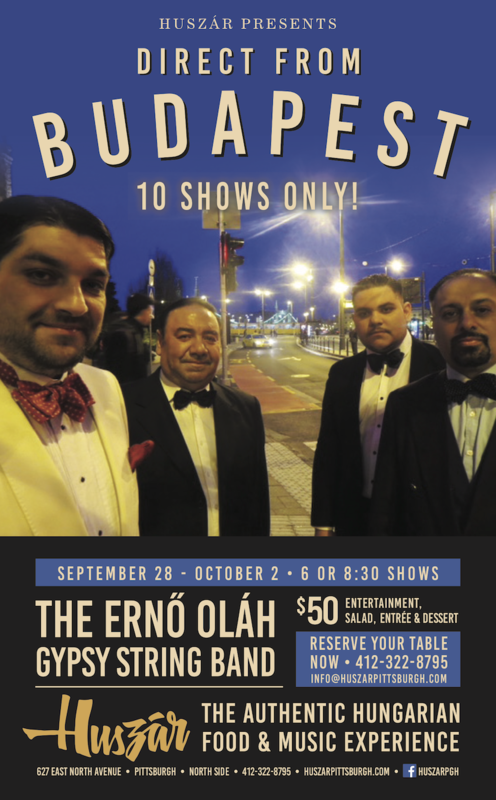 Huszar, Pittsburgh’s authentic Hungarian restaurant, is pleased to announce the exclusive Pittsburgh engagement of popular Budapest-based ERNŐ OLÁH AND HIS GYPSY BAND for 10 performances September 28 to October 2! The intimate Northside eatery, recently awarded with an OpenTable 2018 Diners’ Choice designation, will offer an all-inclusive, one-price special event menu during performances. Traditional Gypsy music is rarely heard today even in restaurants in Budapest. Oláh Ernő and his band will take audience members back to the magical times of Old-World, romantic Budapest, entertaining in a traditional style. Ernő is from a Roma musician dynasty and is respected as one of Budapest’s best band leaders, performing nightly at Budapest’s popular Szeged Restaurant. The quartet features Ernő Oláh on violin, Csaba Váradi on viola (brácsa), András Váradi on bass, and Todor Vaskó on cimbalom, a traditional Eastern European stringed instrument. Friday, September 28: 6 and 8:30 p.m.
Saturday, September 29: 6 and 8:30 p.m.
Monday, October 1: 6 and 8:30 p.m.
Tuesday, October 2: 6 and 8:30 p.m.